A quick last-minute entry for this week’s photo challenge, which asks us to show what is beneath our feet. 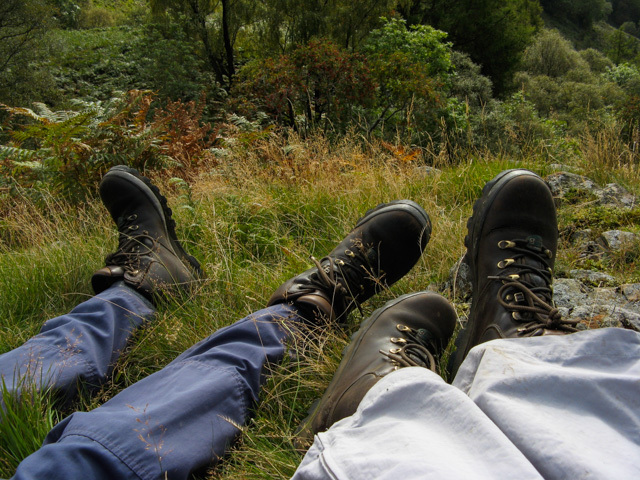 This is my preferred option – feet in walking boots, and a footpath beneath them. It’s a slightly poignant photo, as I’m wearing my faithful old Brasher boots. They were the boots I bought when I first started walking seriously. They’re incredibly comfortable, and I must have walked miles in them. They started to look a bit worn a few years back, so I replaced them with what I thought was the same model. Alas, the design had been updated. Although I persevered, they never really stopped rubbing my heels and ankles, and I eventually had to get a completely different pair. I still have my favourite old Brashers for gardening though. You can see what other bloggers have beneath their feet over on The Daily Post.